Enchanting is a truly beautiful collection of two-tone wedding stationery. This particular style of save the date card also compliments both the Pocketfold and Chequebook wedding invitation collections. All handmade save the date cards are carefully crafted using 285gsm lustrous pearlescent card and finished with elegant satin ribbon. They are printed with your chosen wording and are fully personalised. 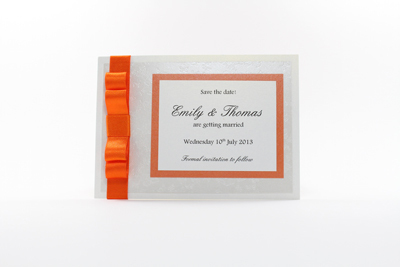 The save the date example shown is made using Dolomite, Diamond Butterfly Embossed and Flame pearlescent card and Orange Delight satin ribbon. and to order using product code STD11.